One of my favorite beaches in South Jersey, isn’t truly a beach. While there is sand and water, this beach is located on the bay in Somers Point. I like to think of this beach as my little secret because I used to live down the street from it and many of my friends who live locally don’t know about it. 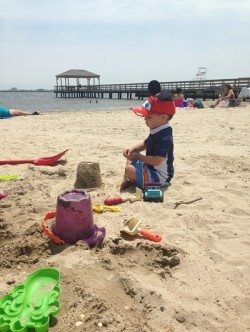 So for those who aren’t familiar with Municipal Park Beach in Somers Point here are 8 reasons why you should check it out this summer. One of my biggest complaints about going to the beach on the islands is that I have to find parking. I hate driving around looking for a spot, and then having to carry all my beach stuff to the beach. At Municipal Beach Park, there is a parking lot right next to the beach. I love that I can pull up right next to the beach and park my car. I’ve never had a problem finding a spot and in the event someone is tired or cranky the car is right there. Also, I’m not lugging toys down a long hot beach. Even though the water is shallow and roped off there are lifeguards on duty every day. Many smaller beaches or beaches on the Mainland don’t have lifeguards. There is always a lifeguard on duty at Municipal Beach daily from 10 am to 5 pm. The bathrooms are clean and the building is located at the back of the beach near the parking lot. Perfect for little ones who need to go right now. There is a playground at the back of the beach with 2 play areas. A perfect break from the sand and great for days when it isn’t beach weather. We’ve been known to visit this play ground in the middle of the winter just for a chance to feel like we are on the beach. It’s a small beach but big enough to play and explore. I love that from my seat I can watch Jack walk up to the water to fill his bucket without losing site of him. From the playground if he decides to walk back to our chair for something I can still see him. I love that this beach is just the right size for little ones. Every Friday night from mid-June through early September Municipal Park Beach hosts the Somers Point Summer Concert Series. Bring a beach chair or blanket and some snacks and enjoy great live music on Friday nights from 7 – 9 pm. For a complete listing of concerts visit the Jersey Family Fun calendar of events. 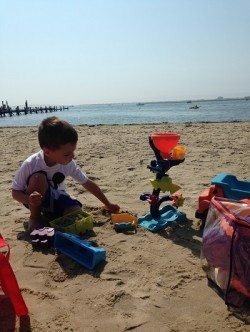 On Monday Nights in the summer, the Somers Point beach hosts a variety of family friendly entertainment starting at 6:30 pm. The entertainment changes weekly and includes movies, puppet shows, and pirates. For a complete listing of events visit the Jersey Family Fun calendar of events. If you want to do more than lounge on the beach, Municipal Park beach is the perfect spot to drop your kayak or paddle board in and go for a ride. The water is shallow enough that this makes for a great spot for beginners to learn and because it’s a small semi enclosed area you don’t have to worry about boats or jet-ski’s. There is also a large pier connected to the beach where fishermen tend to hang out. It’s a nice shady spot to fish or just enjoy the view. 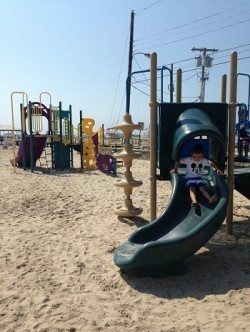 Municipal Beach Park is located between Higbee and New Jersey Avenue on Bay Avenue in Somers Point in Atlantic County, New Jersey.